Summary: Zoos take care of animals and welcome visitors of all ages, but that’s not all zoos do. 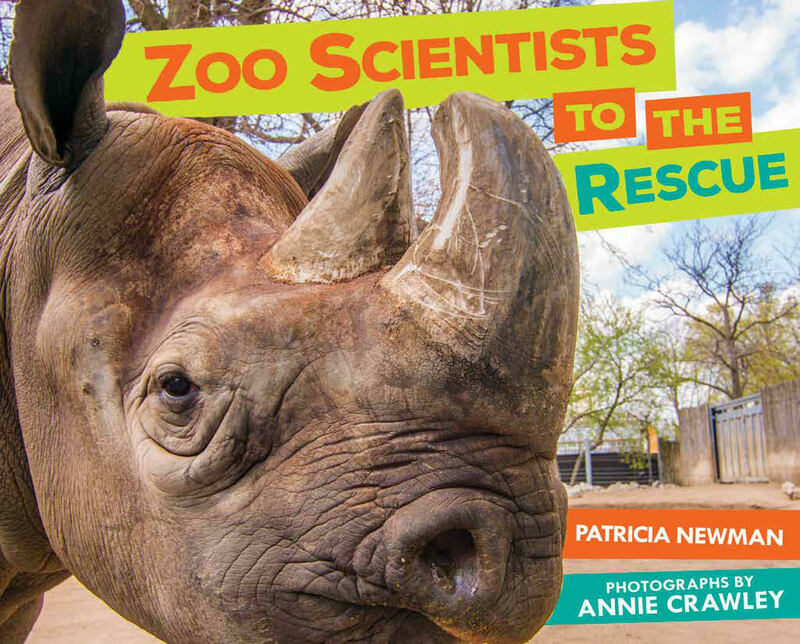 Author Patricia Newman and photographer Annie Crawley bring readers behind the scenes at three zoos to meet scientists working to save endangered animals. Meredith Bastian’s experiences studying wild orangutans help educate both zoo visitors and the zoo workers who care for captive orangutans. Jeff Baughman breeds black-footed ferrets and reintroduces them into the wild. And Rachel Santymire examines poop from black rhinoceroses at the zoo and in their natural habitat to benefit all black rhinos. Find out how zoo scientists are helping us learn more about these remarkable, at-risk species before it’s too late! Review: Patricia Newman’s work always blows me away and Annie Crawley’s photos in Plastics, Ahoy! were breathtaking, so I was so happy to see that they had a new book coming out. In Zoo Scientists, a text is just as brilliantly done as Newman’s other works, she once again focuses on a topic that needs a spotlight. This time, we see how zoos are working towards saving endangered animals. Zoos are such important places when they are done correctly, so I loved this focus on three specific stories about how zoos are helping rhinos, orangutans, and black-footed ferrets. Each section tells us about a scientist at a different zoo, how they came to be where they are today, and how they help the species they work with. I loved the inclusion of each scientist’s story paying special attention to how they each became an expert. This makes Zoo Scientists perfect for looking at not only looking at endangered animals and zoos but how to reach your potential in a career making this book a must-get for classrooms that study any of these things. Teachers’ Tools for Navigation: Teaching guides for all of Patricia’s books including the Zoo Scientist one coming soon can be found at http://www.patriciamnewman.com/teacher-guides/. 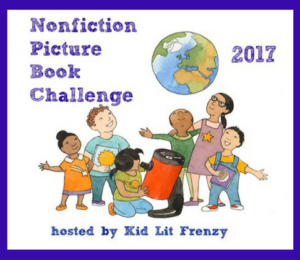 Consider an Author for Earth Day visit! Consider an Authors for Earth Day visit in conjunction with Zoo Scientists to the Rescue. Students research a list of five conservation nominees selected by Patricia Newman and then vote for their favorite. Newman writes a check to the winning organization. The mission? 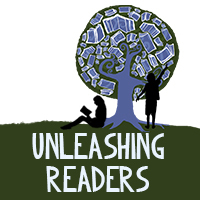 To empower young readers to shape the world around them! 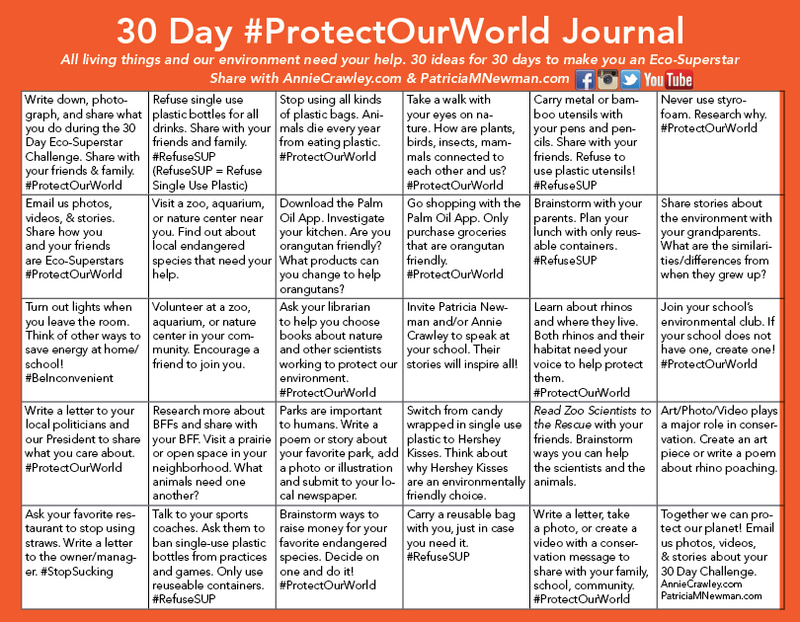 Participate in the 30 Day #ProtectOurWorld Challenge! 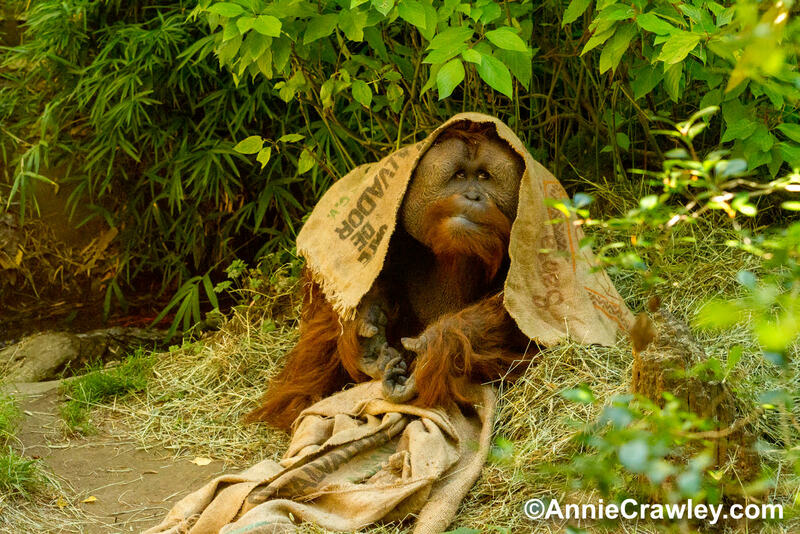 Here is the Orangutan example. 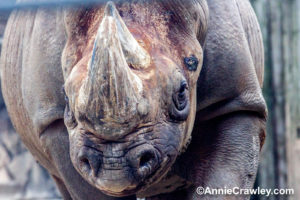 Visit http://www.patriciamnewman.com/books/zoo-scientists-rescue/ to see the rhino and black-footed ferret posters. What steps did each scientist take to become an expert in their field? Why are orangutans’ habitat being destroyed? 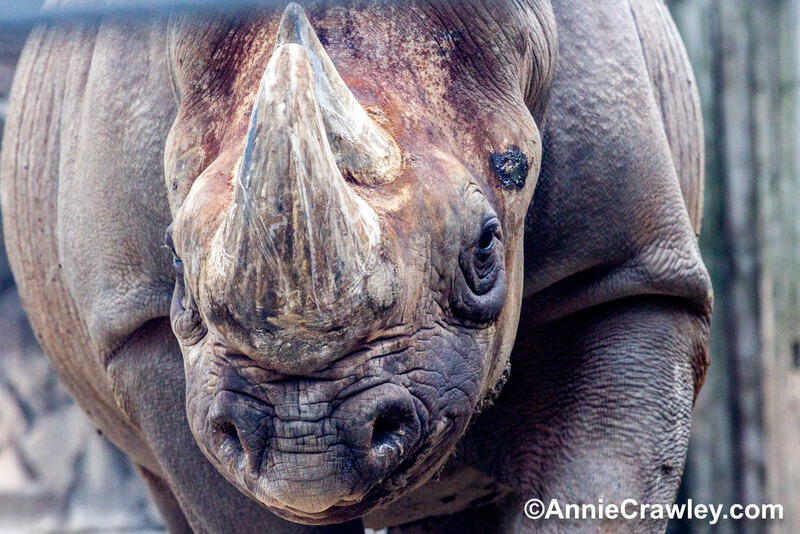 Why is the poaching of rhinos for their horns such a devastating action? How did the expansion of our nation effect the black-footed ferret? How did humans play a role in each of these animals’ endangered status? 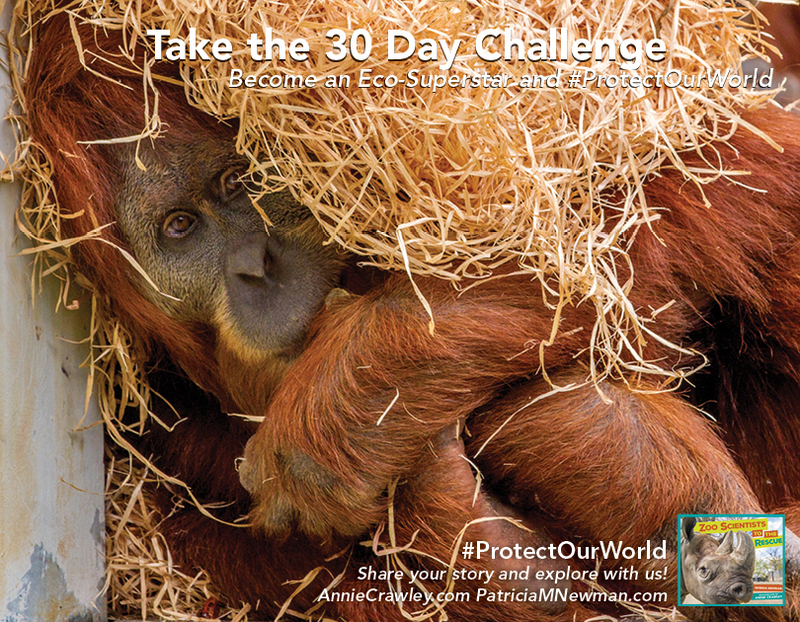 What can you do to help these animals? Visit some of the resources about other conservation stories in the end of the book and share what you learn. Make sure to visit the other stops on the Blog Tour! I like that this book highlights the good that zoos do. There is controversy surrounding them, but it is good to know other stories. 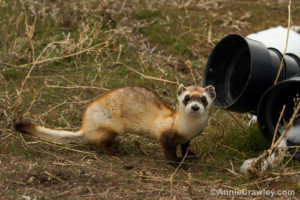 There is a black-footed ferret recovery program here in Colorado which we hear about in the news. Thanks for the detailed post, Kellee! I love the Protect the World challenge. This book has been on my radar since ALA! And this was a perfect book for you to review 🙂 Looking forward to finding it.